The development of Unix in the C language made it uniquely portable and improvable. The first version of Unix was written in the low-level PDP-7 assembler language. Soon after, a language called TMG was created for the PDP-7 by R. M. McClure. Using TMG to develop a FORTRAN compiler, Ken Thompson instead ended up developing a compiler for a new high-level language he called B, based on the earlier BCPL language developed by Martin Richard. Where it might take several pages of detailed PDP-7 assembly code to accomplish a given task, the same functionality could typically be expressed in a higher level language like B in just a few lines. B was thereafter used for further development of the Unix system, which made the work much faster and more convenient. 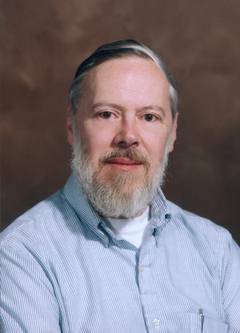 When the PDP-11 computer arrived at Bell Labs, Dennis Ritchie built on B to create a new language called C which inherited Thompson's taste for concise syntax, and had a powerful mix of high-level functionality and the detailed features required to program an operating system. Most of the components of Unix were eventually rewritten in C, culminating with the kernel itself in 1973. Because of its convenience and power, C went on to become the most popular programming language in the world over the next quarter century.